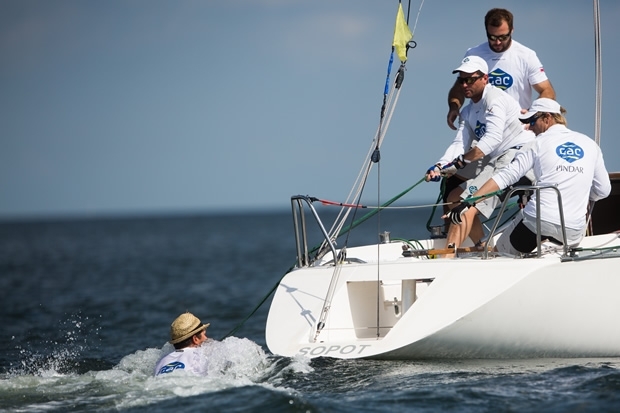 The World Match Racing Tour’s Energa Sopot Match Race set sail today. The twelve competing teams finished the first half of Qualifying in a day of mixed and gusty conditions up to 25 knots. As racing finished for the day, Swede Bjorn Hansen's Nautiska Racing topped the leaderboard with a confident 5-1 scoreline, ahead of Polish national sailing hero and former America’s Cup helmsman Karol Jablonski on 4-2, and Swede Johnie Berntson, also on 4-2. This is the 12th edition of the Sopot Match Race, this year sporting a new title sponsor, Polish energy company Energa. After last years blistering temperatures at the Polish seaside resort during the regatta, winds of up to 30 knots are forecast for this weeks event with strong gusts testing the teams in their opening rounds today. Defending Sopot Match Race Champion, Ian Williams and GAC Pindar finished the day 3-2 after losing against his matches against Jablonski, and then to young Dane Nicolai Sehested after an unexpected ‘man overboard’ incident at the second top mark which saw Williams’ tactician Chris Main falling in the water after a halyard came loose, allowing Sehested to increase his lead to the finish.